Reviewing your current supply chain management systems can lead to better cost controls. Your supply chain and inventory account for a great deal of the sunk costs of your business. Managing them to the best of your ability ensures that no money is wasted on excess inventory, duplicate stock, or rush orders. Where do you start? We’ve put together a step-by-step guide to better supply chain management to help you control costs and rein in excess spending. Ready? Let’s get started. In order to tighten areas where excess inventory and poorly managed orders may be wasting money, it helps to review your past and current supply chain management methods. To do this, use a supply chain assessment. A supply chain assessment outlines your current manufacturing and supply chain processes to find wasteful areas. These areas may be ongoing or related to current orders. Use your company’s ERP and business intelligence systems to review order history, current inventory, historical orders, and other data to determine whether you are managing your supplies adequately. It’s tempting to spot problems and fix them right away, but wait a bit. You need time to plan and automate many areas of the supply chain for successful optimization. There are three things you can do immediately to help improve your supply chain management and control costs. Inaccurate forecasting leads to waste. You’ll order too much or too little, or worse, be caught off guard when a large order comes in and you don’t have enough raw materials on hand to fulfill it. Improving the accuracy of your forecasts can help you reduce waste on unused materials and ensure you have the right amount on hand. If you’re struggling with accuracy in that forecast, additional inventory cost could be reducing your profits. Planning for upcoming demands is vital. By focusing on inventory forecasting accuracy, you’ll improve your ability to manage purchases and utilize existing inventory. Are you still using manual processes to input data into your systems? Manual data entry opens up many areas for potential mistakes and errors to creep into your data. Automating system integrations reduces the need for manual data entry. Integrating your ERP with advanced supply chain software cuts out the manual processes, drastically reducing the margin of error. Productivity also improves with access to real-time data. Without the right data and systems, you likely will not be successful with forecast accuracy. Sometimes it feels like we’re all data-rich and knowledge-poor. We have a wealth of data at our fingertips, but what is useful and valuable? Check to make sure you are looking at the right metrics when assessing your company’s reports. 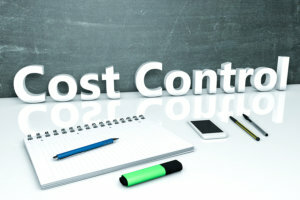 These are the items to consider when seeking to control costs. By focusing on these four areas for improvement and monitoring, you can manage the supply chain more tightly and control costs. Supply chain improvements take time and consistent effort. But when you’ve completed your task, you’ll find the smooth flow of goods, improved numbers, and happier customers worthwhile. Take time now to sort through what’s needed, make a plan, and get it done! Emerald TC provides software and consulting for small to mid-size companies. We can help you choose the right ERP system for your needs and offer Acumatica and other software packages for every type and size manufacturing company. Contact us or call 678-456-6919 for more information.